Today is the first day of the IDFB, and the opening week sees a full programme of free outdoor performances, world class theatre shows and opportunities to get involved in the festival. First up is the premiere performance of Home, which starts at 1.30pm today, as dancers animate Birmingham city centre using ideas, inspirations and choreographic material contributed by 1000 individuals through workshops, open days, and uploading films online, all relating to people’s feelings about the theme of ‘Home’, and what it means to them. Sonata Movements is a combination of drama and music put together by AT Concert Theatre. Four short pieces of theatre make up the programme. Three are ‘proper’ scripts, and one is an accompanied reading of TS Eliot’s ‘Portrait of a Lady’. In counterpoint to them is the music – piano playing of great style and intensity performed by An-Ting Chang. If you went along solely for the music, I don’t think you’d be disappointed. An-Ting Chang, currently studying for a PhD in music performance at the Royal Academy of Music, plays with a lot of verve and has taken on here some of the monstrously intricate and well-known pieces in the piano repertoire. 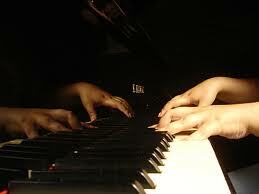 Pieces by Shubert, Chopin, Prokoviev and Beethoven all feature. Alongside these are the dramatic performances. First is a two-hander, ‘Abortive’, an early piece by Caryl Churchill in which the piano becomes a part of the presentation. The play describes quite painfully a couple whose assumptions about their relationship have been fractured. Kenneth Emson’s ‘Other People’s Gardens’ follows, a short piece enlivened by the fresh and honest performance of Darren Douglas-Letts. James Northcote is next tasked with delivering TS Eliot’s ‘Portrait of a Lady’ and finally, Jonathan Newth gives us Svetlovidov, the embittered actor whose powers are failing fast, in Chekhov’s ‘Swan Song’. All are very competently played and it is an interesting programme, but from an audience’s point of view, the question to be answered is whether the music adds to the dramatic presentation. Some of the pieces unquestionably worked better than others, and a familiarity with them would certainly help. Sometimes the music, stylishly played though it was, did seem to fight against the actors’ delivery, rather than enhancing it. Sometimes too, it was impossible not to make a choice of concentration between the music and the drama. Probably the most effective piece overall was the dramatised TS Eliot poem, which seemed to fit nicely with the Chopin Nocturne, each ‘positioning’ the other in terms of style and character. The others were harder work for this member of the audience certainly, and this is not the kind of production that allows you to drift along under its spell. There are some great moments, when the music really does underscore the text of the plays (in the Chekhov particularly when Svetlovidov redicovers some of his old youthful intensity), but more often the audience is faced with a difficult choice of where to address its concentration, largely because of the quality of both music and dramatic presentation. You are currently browsing the Fringe Report blog archives for the day Monday, April 23rd, 2012.